Savor these warm-weather brews before fall arrives. We're halfway through September, and I'm already feeling the pull toward autumn beers. The trouble is, I'm not ready to give up on summer just yet. Yeah, those Oktoberfest and select pumpkin beers might be whispering in my ear, but for one more week, I'm still holding on to dry, thirst-quenching ales and lagers—and these two fit the bill. Uinta 801 Pilsner: This beer pours a clear, golden straw color that's light in terms of carbonation and features a thin, white, frothy head that dissipates slowly to a thin lacing. The aroma is typical of the style, with grassy hops and a grainy malt coming through. It's pretty well-balanced—not incredibly fragrant, but still pleasing to the nose. The flavor features a good dose of Pilsner malt right up front with caramel, cracker and bread dough backing it up. The maltiness transitions into bitter, grassy hops slowly, with the strength of the hops becoming greater the longer the beer stays in your mouth. Bitterness here is relatively strong. Overall: As far as 4-percent session beers go, this is one of the better ones. Instead of just tasting like watered-down macro lager, it actually tastes like something I'd like to drink. To me, it gets most of the major characteristics of classic German Pilsners right without really mimicking any specific classic example of the style. I'm not saying you'd entirely confuse this with an authentic German Pilsner if tasting it blind, but I am saying it's a reasonable and admirable approximation of the style. In the end, I rather like it, and would not have a problem recommending it to fans of Pilsners or those new to the world of European-style lagers. Kiitos Cherry Berliner Weisse: Pouring a crystal clear red color with pink highlights, this brew has a single finger of fizzy soda-like head with less-than-great retention. Once you get your nose on top of it, juicy, tart cherries with lemon, green apple and almond tingle your nostrils with a pleasant and drying acidic bouquet. Right off the bat, you get a fruity/lactic tartness on the tongue along with light cherry twang. Lingering notes of almond, lemon and pear begin to emerge with green apple, wheat, cracker and light lacto funk rounding out the back end. A bit of earthiness lingers on your palate on the finish. There's great complexity and balance in the combination of fruity/acidic yeast, cherries and light pale malt flavors, with a great malt/tartness balance and zero puckering flavors after the finish. As you might expect from a 4-percent brew, there's little alcohol heat. Overall: This is a very nice fruited Berliner weisse style. It's got all-around nice complexity, robustness and balance—very smooth, crisp and refreshing to drink, with modest acidity and tartness. I appreciate the really nice level of cherry presence, with great balance of the base style, making it a very traditional tasting example that's not overly lactic on acidity. I guess after tasting these, I've decided not to be a prisoner of the seasons. Yeah, I'm looking forward to robust brews, but when clean and dry calls, I'm answering that damned call. 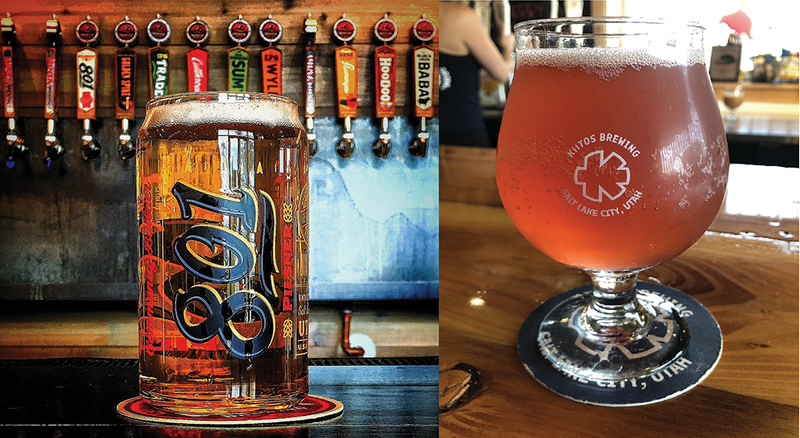 Uinta's 801 can be found in almost every corner of the planet, but the Kiitos cherry is only at very select spots in town, one of which is its downtown brewery. Next week, we dive into autumn. As always, cheers!